Goods are not sold on a trial basis and are not provided on a sale or return basis. Goods must be returned in the original packaging, with all accessories. Goods must be returned in ‘as new’ condition, and suitable for resale. All goods must be un-used and un-opened. In all cases you must contact us first to obtain a returns authorisation; goods returned without valid authorisation will be rejected. You are responsible for the cost of returning unwanted or wrongly ordered goods to us, including adequate insurance cover and advise that you post with proof of delivery, as any returned items we do not recieve without providing proof of delivery, will not be credited. 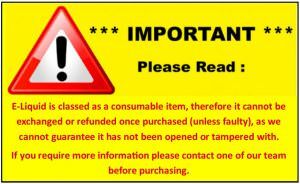 In addition, if returning unwanted items the origanal postage fee will be deducted and we may, at our discretion, apply a restocking fee of 20% of the total order value. If you are requesting alternative items be sent out, we will add any additional postage to send the alternative items. This does not affect your usual consumer rights, including your right to claim a refund, replacement or compensation where the goods are faulty or misdescribed. Faulty items will be replaced within the warranty period. Please note:- Atomisers, clearomisers, cartomisers etc are exempt from the normal warranty period, as they are classed as consumable items they must be checked as working on arrival and any faults reported within 48 Hours.